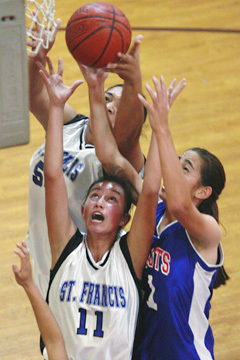 Suititi Takai and Kanani Perry of St. Francis battled Ashley Medcalf of Christian Academy for a rebound last night. If there was ever a game to dub as David vs. Goliath, this was it. St. Francis defeated a Christian Academy squad composed of only six players 73-55 last night in the first semifinal game of the ILH Division II girls varsity basketball tournament at Damien Memorial High School. The win guarantees the Troubadours a berth in the Division II state tournament, along with La Pietra and Word of Life. St. Francis will take on Word of Life tonight at Saint Louis' McCabe Gym at 6:30 for the tournament championship. The ILH's fourth and final berth will be awarded to the winner of a play-in game between Christian Academy and Hawaii Baptist today at McCabe Gym at 5 p.m. preceding the Division II tournament championship. Despite the loss, the story of the game was the dominant performance by Patriots forward Ashley Medcalf. A day after putting up 42 against St. Andrew's Priory, the junior scored a game-high 45 points, carrying her team throughout the game and often going coast-to-coast and scoring over four or five defenders. "We've been struggling this whole season, barely getting five (players on the court) some games, so we're just trying to work together," Medcalf said. "The other coaches think that if they can stop me, they can stop this team. So that means I have to work extra hard because I hold the team together." "She's just an awesome athlete," said St. Francis head coach Paul Tanaka in response to Medcalf's performance. "Despite how much I know she wants to score, she's a team player because of the way she made an effort to share the ball." Danielle Tanaka led the way for St. Francis (13-2) with 23 points. The speedy point guard drained five 3-pointers despite sitting out most of the second half. The Troubadours started the game on a 9-0 run and increased the lead to 24-7 by the end of the first quarter. Medcalf scored all of her team's points in the period. St. Francis used a stifling defense and obvious height advantage to control the ball and built up a 47-18 lead at halftime. "We came out intense from the start -- we had talked about doing that, and it was a really good team effort," Tanaka said. "We played tough (defense) all around and focused a lot on Ashley." But Christian Academy (6-8) did not give up, and kept its intensity level high despite having only one sub. After keeping pace with the Troubadours in the third period, the Patriots outscored St. Francis 24-9 in the fourth, making the final score respectable. "Even though we're down by a lot, we keep fighting," Medcalf said. "The other teams have subs, and we don't get to rest at all during the game. But if we put our minds to it we can do anything." The lopsided victory gave Tanaka the opportunity to give his reserves well-deserved playing time. "I feel real fortunate that we were able to play our non-starters, because they push our starters in practice, and it was really good that they could play," Tanaka said. "They don't get the recognition that they deserve." CHRISTIAN ACADEMY--Ashley Medcalf 45, Michel Chon 4, Jessie Kamikawa 0, Reyna Cachola 3, Jessica Bento 2, Jasmine Tory 1. ST. FRANCIS--Kaui Berinobis 2, Nicole Perry 10, Kanani Perry 8, Danielle Tanaka 23, Emma Dacalio-Spencer 2, Bryanna Batts 2, Ka'i Bento 0, Rochelle Nakagawa 2, Kristin Enomoto 1, Melissa Allen 2, Jaimie Iwashita 12, Kacee Coito 4, Siutiti Takai 5. 3-point goals--Christian Academy 2 (Cachola, Medcalf), St. Francis 5 (Tanaka 5). Leading scorers--WOL: Careena Onosai 19, Shayna Onosai 15. HBA: Jodi Kanemoto 18, Janine Diehl 13. Britni Ronolo scored nine of her game-high 19 points in the third quarter and the Menehunes outscored the Trojans 18-8 in the period to pull away for the victory and finish fifth in the OIA Red playoffs. Both teams had already qualified for next week's state tournament. Joleen Realin nailed the only 3-pointer for the Trojans and led the team with 11 points. MOANALUA--Michelle Hardy 0, Brianna Lagat-Ramos 9, Jade Miller 7, Kimberly Sato 0, Deena Dela Cruz 2, Janelle Uncango 0, Jamie Ronolo 8, Indah Widyakasuma 0, Terina Blue 5, Dawn Dela Cruz 0, Britni Ronolo 19, Nikol Felder 2. MILILANI--Kimi Ebina 0, Kelsey Woodward 3, Jamie Kaleiwahewa 0, Summer Wigeil 0, Christina Korodan 5, Rayna Downey 2, Lia Nishikura 0, Ashley Anthony 8, Haunani Richardson 0, Chantel Tanuvasa 4, Joleen Realin 11, Diamond Badados 0. 3-point goals -- Moanalua 2 (J. Ronolo, Blue), Mililani 1 (Realin). Ui Kekauoha nailed two 3-pointers and poured in a game-high 15 points and Candyce Ames added 12 as the Knights clinched the final OIA berth in the Division II state tournament with the win. Paige Moi scored 12 points to lead the Bulldogs, who were outscored 14-8 in a pivotal third quarter. Ashley Moi and Olivia Phommachanh added nine points apiece. CASTLE--Kori Derinovis 0, Candyce Ames 11, Niki Kobashigawa 0, Kellsie Sasaki 5, Sarah Phromisiri 2, Ui Kekauoha 15, Tracie Kam 3, Ette Ameperosa 2, Shanyn Fafard-Kaaihue 6. KAIMUKI-- Olivia Phommachanh 9, Mindy Hirokawa 4, Sinead Scovil 0, Keri Nakahashi 6, Kanoe Nicola 0, Ashley Moi 9, Paige Moi 12, Jackie Tema 1. 3-point goals -- Castle 4 (Kekauoha 2, Ames, Fafard-Kaaihue), Kaimuki 2 (Nakahashi 2).